This sequence includes many of the elements that make a Bond adventure so unique: exciting danger, beautiful women, a megalomaniac villain, an exotic location (in this case, the Cala Di Volpe in Porto Cervo), and – of course – beautifully tailored attire. Bond arrives for his boat ride with Anya and Naomi in a lightweight worsted wool blazer colored a very dark shade of navy that almost appears black in some light. The single-breasted blazer has notch lapels with just enough extra width to be stylish in the late ’70s without surpassing the bounds of timeless style. Bond turns on the charm. No doubt there’s a beautiful woman around. The features of Bond’s blazer keep it very distinctive. There is a welted breast pocket as well as flapped hip pockets that slant back, but there is also a flapped ticket pocket – also with a rear slant – above the right hip pocket. All of the blazer’s silver-toned buttons – the two on the front and the four on each cuff – are metal as one often finds on a blazer, but they are sewn-through unlike the usual shank buttons. The shoulders are roped, and the sides are split with two 12″ long double vents. Bond dresses to impress both friends and foes. According to Matt Spaiser at The Suits of James Bond, this blazer was made by Angelo Roma. Matt’s post also has great insight into the fit and tailoring of this garment. Bond’s boldly-striped cotton shirt with it’s single-button tab “Lapidus cuffs” was likely made by Moore’s usual shirtmaker Frank Foster. The shirt is white with alternately spaced blue candy stripes. The large collar has long points and the white buttons fasten down a front placket. Turnbull & Asser offers its own white-and-blue men’s “candy stripe” shirt that, while different, should be worthy of consideration given the brand’s reputation for quality and storied relationship with the 007 franchise. This Roger Moore sandwich reinforces the idea that playing James Bond may be one of the luckiest jobs an actor can get. Bond’s blue silk tie reflects the boldness of the shirt while also providing a contrast to the dark, muted blazer. It’s made from shantung silk, a more comfortable alternative for warm climates. The blue also nicely evokes Stromberg’s whole underwater theme. Too bad Stromberg didn’t like him. Bond’s white flat front trousers, likely also by Angelo Roma, are one of his few true concessions to the era with their widely-flared bell bottoms. Ignoring this disco-friendly feature, Bond’s trousers are an appropriately naval choice given that we’re seeing Bond at sea and this is Moore’s “Commander Bond” flick (as You Only Live Twice was for Connery and Tomorrow Never Dies would be for Brosnan). They appear to be a lightweight wool gabardine. Moore keeps the blazer buttoned through most of the sequence, but behind-the-scenes photos indicate that the only closure for the trousers is a concealed hook under the extended waistband; there are no belt loops or adjustor tabs. Bond’s bell bottoms provide both luxury during leisure and a dramatic, sweeping exit from a villain’s lair. Moore wears his usual black horsebit leather moccasins with gold horsebit details and tall-heeled leather soles. They may be Ferragamo, an appropriate choice given the Italian setting. He also wears black socks, a surprising choice given the white trousers and the heat of a summer day in the Mediterranean but at least it works with the black shoes and dark blazer. The Spy Who Loved Me marked the first film in Seiko’s product placement deal with the Bond franchise, which lasted through Roger Moore’s last appearance in A View to a Kill. In this outing, he wears a steel Seiko LC Quartz DK001 digital wristwatch, identified as model 0674-5009 by Dell Deaton on his blog, James Bond Watches. More information about this comparatively rare watch can also be found at James Bond Lifestyle. Had digital watches existed in the 1950s, do you think Ian Fleming would have outfitted his hero with one? They do seem to serve the literary character’s practical sensibilities. 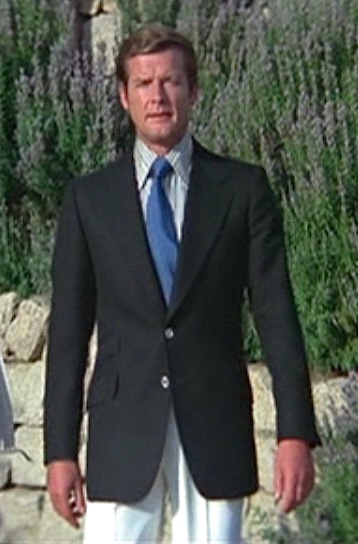 Moore would again sport a navy blazer and light slacks in his next Bond outing, Moonraker, when first meeting Hugo Drax at his California estate. 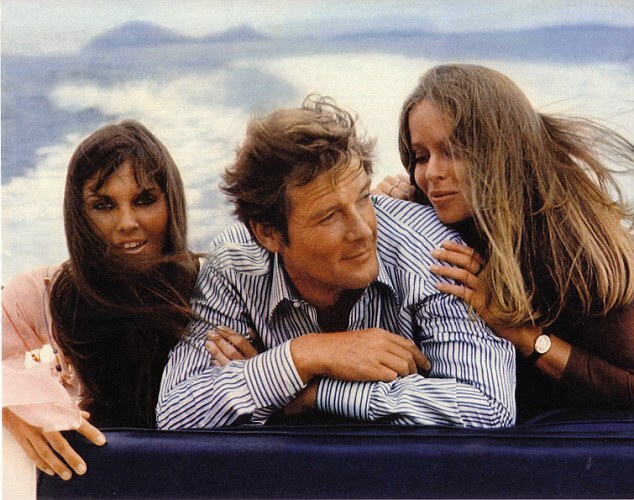 Caroline Munro, Roger Moore, and Barbara Bach relax between takes. James Bond’s fashionable seaside blazer and slacks comfortably blends both military-inspired aesthetics and classic resort wear. Iconic Alternatives has a great rundown of affordable options to channel elements of this, such as the blazer, and many other 007 outfits. What’s the perfect car for a British secret agent in Italy? The Italian-designed and British-made Lotus, of course! Q personally arrives in Sardinia to greet 007 and equip him with his latest piece of technology, a white 1976 Lotus Esprit. The custom-built car/submarine was nicknamed “Wet Nellie” to pay homage to “Little Nellie”, the yellow autogyro flown by Sean Connery ten years earlier in You Only Live Twice. In total, six different Esprits were featured during the filming of The Spy Who Loved Me but only one – piloted by ex-U.S. Navy SEAL Don Griffin – was modified as a wet sub. “Wet Nellie” was built by Perry Oceanographic, Inc. for about $100,000 and featured four electric motors, all propelling the sub’s forward motion only. In September 2013, Elon Musk bought the submarine at auction for £650,000 and has since stated that he hopes to convert it to reflect the functionality as seen on screen. This was not a stock option on any series of Lotus Esprits… at least not until Elon Musk has his way. The Esprit first went into production in June 1976, eight months after it was launched at the Paris Auto Show, and the first model years – 1976 through 1978 – are now known as Series 1 (S1) Esprits. The longitudinal Lotus 907 engine returned from the Jensen Healey, powering European models with 160 bhp and American models with 140 bhp, down-rated in the states for emissions purposes. The first Esprits were designed by Giorgetto Giugiaro with redesigns in the ’80s, ’90s, and 2000s by Peter Stevens and Julian Thomson but it was Giugiaro’s original polygonal vision that gave the Esprit its distinctive look. The handling of the lightweight car impressed Lotus test driver Roger Becker while filming The Spy Who Loved Me, and the S1 generation of Esprits is said to have had the best steering of any of the car’s three decades of production. The last Esprit was produced in 2004, bringing the total production amount to 10,675 cars. 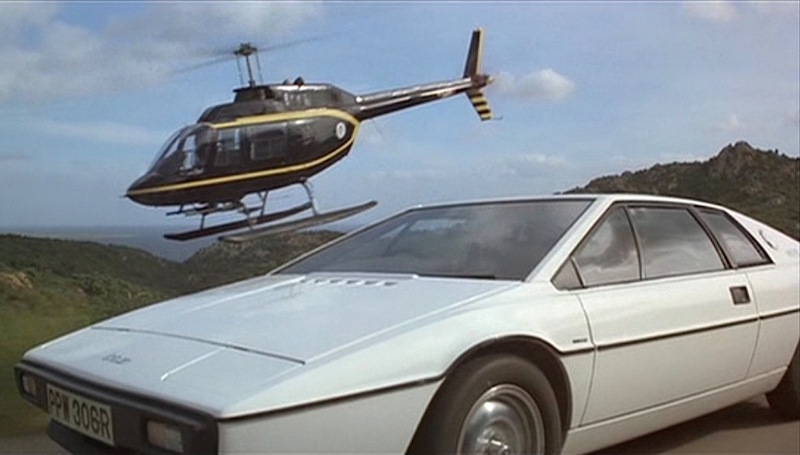 Main unit production on The Spy Who Loved Me began in August 1976, two months after the first Esprit was produced, with Lotus test driver Roger Becker serving as the stunt driver while filming on Sardinia. Bond would again be seen behind the wheel of a Lotus Esprit four years later in For Your Eyes Only when he drives a white 1980 Turbo model and, after that car explodes, a red 1981 Turbo model. You ever get the feeling that somebody doesn’t like you? I once dated a woman who looked very much like Naomi (Caroline Munro).